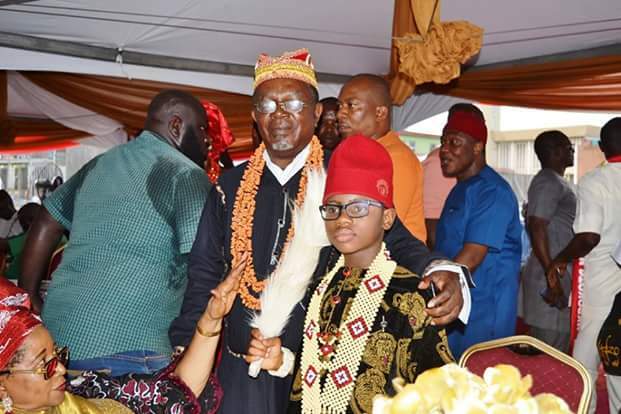 The Africa’s Best Kid Entertainer/Stop Child Cruelty Campaigner; OzzyBee a.k.a OzzyBosco WonderKid was among the special dignitaries that graced the Igbo Unity & Cultural Day Festival organized by Ohanaeze Ndigbo, Lagos. The National Stadium witnessed the largest turn out of crowd in a colouful and carnival-like parade of masquerades ever recorded. Everything necessary to make an occasion unique was surplus; since the event was powered by the chief host himself; Dr Ifeanyi Uba, Capital Oil CEO who graced the occasion with his amiable wife. OzzyBee who equally is a multiple titled chief strikingly dressed in his full Igbo chieftaincy regalia mesmerized the huge crowd with his award winning song; SMILE AGAIN and received standing ovation from Capital Oil boss and other dignitaries. Notable amongst the guests of honour were fmr Governor of Anambra State; His Excellency Chief Chukwuemeka Ezeife (Okwa Dike Igboukwu), His Excellency Dr Ifeanyi Ugwuanyi; Executive Governor of Enugu State, represented by Ozo Gab Azubuike Onuzuilike, Dr Obiorah Chukwuka Executive Director Greenlife Pharmaceuticals LTD who chaired the historic event and other notable friends & business associates of the Authority Newspaper Publisher. Thumps up to Ohanaeze Lagos president Chief Fabian Onwughalu and Ohanaeze Ndigbo worldwide for organizing the epic event. Kudos to Veteran Flutist, Dr Tee Mac for his esteemed presence which added colour to the day.